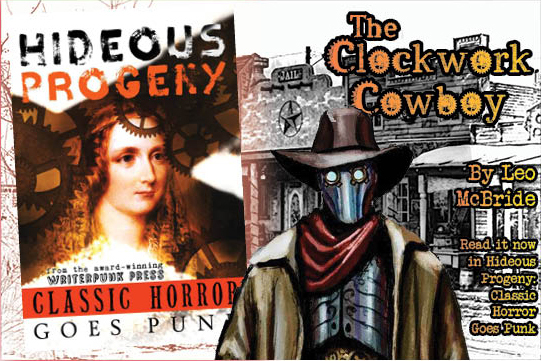 It's that time of year when award nominations are considered - and so here, I round up first of all the stories from Inklings Press that you might want to weigh in your thoughts as you make your nominations, and then a story or two of my own. But first, let's talk about Tales From Alternate Earths 2. Tales From Alternate Earths 2 is, as you can tell from its title, a sequel - and the first anthology earned two Sidewise Award nominations, for Daniel Bensen's story Treasure Fleet, and for the tale Twilight of the Mesozoic Moon, by Brent A Harris and Ricardo Victoria. Daniel went on to win the Sidewise Award - while Brent went on to earn a second nomination for his novel, A Time of Need. Both authors return for this second volume. 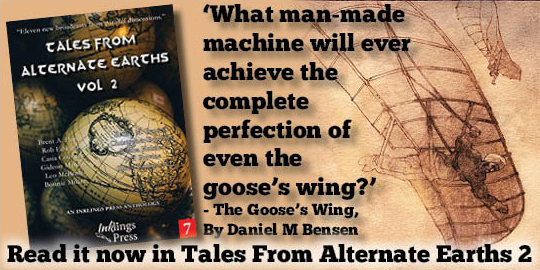 The Goose's Wing, by Daniel M Bensen, tells the story of a world in which 10th century Andalusian polymath Abbas ibn Firnas really does invent the glider - reshaping the world as humanity conquers the distances that separate us. He soars into this new world, aloft on board a glider, but still about to plunge into a cauldron of prejudice and rivalry. 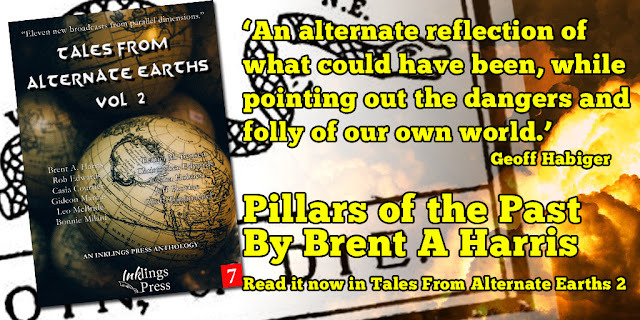 Pillars of the Past, by Brent A Harris returns to the shifts in American history that he loves to explore - in this instance an America which never split from Britain - but where the strains of colony life linger into a modern day torn apart by a desire for independence, and the troubles of terrorism. What choice would you make if the price of your vote might be your lifeblood itself? 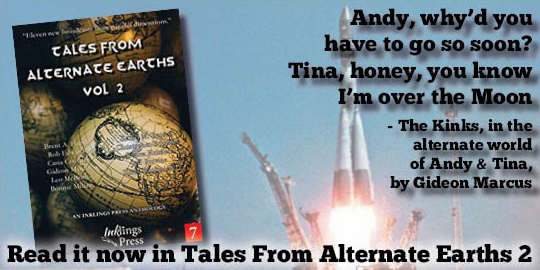 Andy & Tina, by Gideon Marcus turns our attention to the Soviet astronaut program, where the Andy & Tina of the title are Valentina Tereshkova and Andrian Nikolayev, lovers and cosmonauts. Gideon reimagines their world - and sets it to a soundtrack by an alternate universe version of The Kinks. There are lies, there is deception, there is romance - and there is a truth kept from the world by these star-crossed lovers. The Matthew, by Christopher Edwards, revisits the discovery of the New World, but with a different path, or perhaps a different course might be better said. The Matthew was sailed by John Cabot to Newfoundland in 1497 - and this story considers the consequences of that journey, had it gone a different way. Suppose Columbus wasn't the man hailed with that discovery, how might things have changed? The Emperor of the North, by Rob Edwards, considers a world where global warming isn't the fear - but global cooling. Gripped in an eternal winter, that crushes its hand around the Earth further year by year, how might we live? How would we survive? And who would be there to tell the remaining survivors about what comes next? The Accused, by Casia Courtier, visits a distorted Earth where the Salem witch trials kept their grip on the nation - and where knowledge and literacy became the Devil's tools. When books are banned, when their pages are burned, what do people risk for the words that speak to their hearts? The Fairy Courts, by Jeff Provine, bursts to life with a hall full of mythology. Jeff is a collector of folklore, and here he showcases a world where creatures out of myth stalk our own halls and corridors - and where an exhibition of caged cryptids burst loose, and havoc follows in their wake. 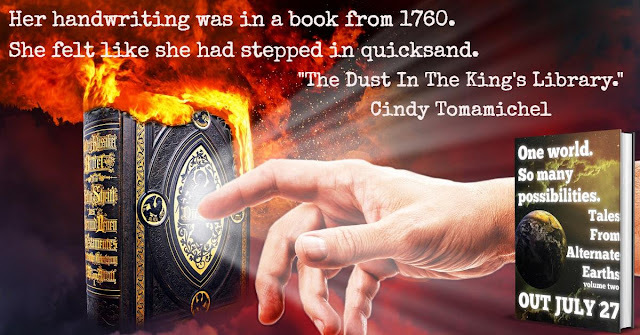 The Dust In The King's Library, by Cindy Tomamichel, loops through time and considers the consequences of trying to make an adjustment to our own history - particularly the circumstances surrounding a certain mad king, and a poisoning. But if we change our own history, where do the dominoes fall? What are the consequences if we dare to write a new page in our history, there in the King's Library? 1969: A Space Oddity, by Jessica Holmes, is our next entry and... well, we don't know how to break it to you, but... the Moon landings were faked, you know. Really. Well, maybe. And Jessica has a story to explore just such a possibility. Part Wag the Dog, part Wizard of Oz, she introduces us to another man behind a curtain, spinning a lie. 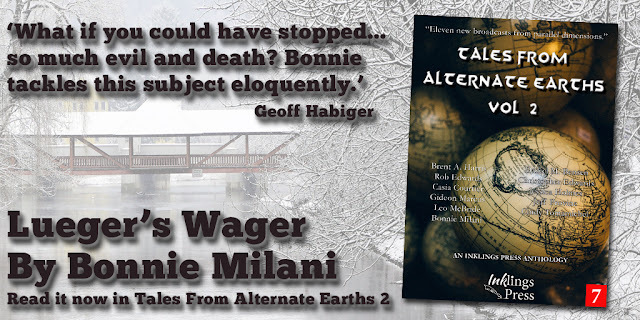 Lueger's Wager, by Bonnie Milani, presents a classic conundrum - what if the path of Hitler could have been stopped, or changed? Bonnie transports us back to a time before Hitler set on the course he followed in our world, but still a time full of prejudice, hatred and the cauldron of conditions that formed his vile outlook. What would it take to change things? A bullet? An army? Or just a few words? Under Pressure, by... well, me. I'm not one to toot my own horn, but while I'm busily borrowing the Inklings Press horn, I might as well toot out an extra note. 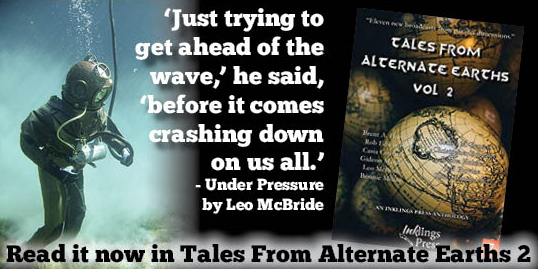 Under Pressure is my story set in a world where Jacques Cousteau's dream of an undersea city comes to pass - only to face the dangerous tides of politics... and murder. History is a swirl of tides - and one change in current might not be all that is needed for such a dream to come true. Also for your consideration... I would also like to mention Inklings regular Ricardo Victoria, who has been laser focused on his novel this year, coming out in 2019 - but he was included in an audio anthology over at The Wicked Library. His tale The Scratching leads their first Tricks and Treats collection - and you can listen to that here. That's it - my only other published stories this year have been flash fiction pieces, which are probably too short to consider, though if you want to read them, you can follow the links to read What We Become, How I've Come To Hate The Sky, Where You Last Expected, and Killer App. Here's to some more stories published next year - especially if baby lets me get to the keyboard just a little more often!